The pipes in Scotland seem to have earliest dating records around the world and are a landmark feature of Scottish heritage. In Scotland each clan would have its own piper who would compose their own music which would be played for events in the clan such as battle, births, deaths and marriages. It was not until the 1800's that the Scottish bagpipers began to record their music compositions by writing them down in a standard notation, prior to that the piper would create his own notations for his music. Much of the older Scottish bagpipe music features elements of the warring Scottish clans with compositions such as ‘the Campbell's are coming' and ‘the march of the Cameron men'. 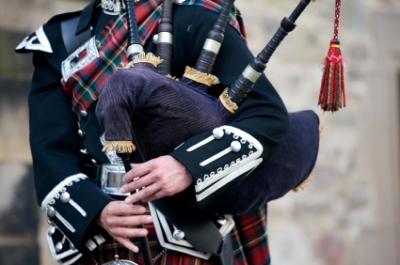 A traditional accompaniment to the bagpipes in Scotland was introduced during the Napoleonic wars and was the Drums. If you were asked to come up with a traditional image that represented Scotland you would undoubtedly turn to tartan and bagpipes. Scottish bagpipes are as much a part of Scotland as haggis and Robert Burns, and are a treasured and old instrument that have a mystique all of their own. While the bagpipes are not confined to Scotland, it is here that they are best known – and most associated with – although there are many countries in Europe that also have a traditional pipe instrument, and many varieties closer to home, too. When talking of Scottish bagpipes we are, in fact, talking of an instrument more properly known as the Highland bagpipes or the Great Highland Bagpipe. The highland bagpipes are the grandiose and familiar type played by pipers across the land in ceremonial duties and more, and are as impressive to look at as they are to listen to. The sound of highland bagpipes is absolutely unmistakeable – a constant drone accompanied by the reedy tune that many find difficult to listen to and others adore – and the highland bagpipes have a history that is very much entwined with military history and clan in-fighting in the area. Bagpipes were first recorded in Europe in the 1200's, notably in Spain and the Iberian peninsula, and the first instances of the highland bagpipes is around the year 1400. Despite this, a famous and long established clan – that of Menzies – lays claim to the remaining parts of a set of pipes that they say were played at the battle of Bannockburn in 1314. This is unverifiable, and historians are prone to put it down to local legend. A complex instrument, highland bagpipes are played by being blown – the piper blows into a mouthpiece that inflates the bag, and this is the bag that is squeezed by the piper to get the air into the chanter and the drones, the parts that make the noise. The highland bagpipes are not an easy instrument to play, and it is notable that they differs greatly from the Northumbrian small pipes, a close relative in instrument terms, in that that instrument is powered by bellows and is not blown. Ceremonial duties still keep the highland bagpipes in service in the British Army; no Scottish regiment would be complete without a pipe section, and the legendary and world famed Band of the Coldstream Guards stand as one of the most famous proponents of the pipe music military tradition. In times gone by a piper would accompany troops onto the battlefield, presumably as the one in the legend of Bannockburn did with the Menzies. It is an interesting instrument that is as much a part of Scotland as any of the famous images we associate with the country; the highland bagpipes stand proud and loud in musical terms, one of the most instantly recognisable instruments in the world today. The sight of a kilted Scots guard in full regalia playing the highland bagpipes is a popular tourist image, but is also a very real one that has its place in modern life as much as it did in the 1400's.